From April 28th to July 30th, 2016, Galerie m will be featuring two works by Jan Wawrzyniak (b. 1971 in Leipzig). In his third solo show since beginning his collaboration with Galerie m ten years ago, the Berlin-based artist continues to abide by his rigorous principles: the exclusive use of charcoal and primed canvas to focus on exploring space and spatial perception. In the current exhibition, he creates a compelling installation out of only two works. The wall always plays a vital role in Wawrzyniak’s works, as backdrop and as a specific level in the installations. 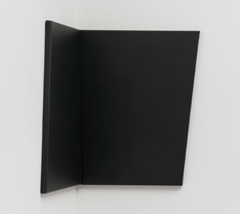 The two canvases in the work Niche from 2015 are completely blackened with charcoal and placed in a corner of the room at right angles to one another. 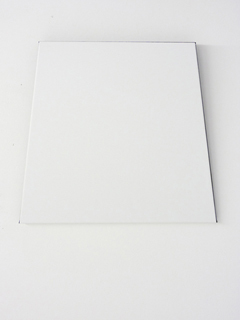 The flat canvas becomes a three-dimensional object here, with the wall serving as base for the drawing and thus becoming at once a part of the work and its frame. Despite the supposed opacity of the color black, here it opens up for the viewer an imaginary new space that seems to lead like a deep tunnel to a further level in the virtual image space. The effect is as though the exhibition space were expanded by a wall leading to another dimension: rather than remaining a mere flat panel on the wall, the work Niche has a palpable impact on the space and thus takes on the qualities of a sculptural installation. This impression is strengthened further by the second work in the exhibition, Framed Priming (2016). This work is three times as deep at the upper edge as it is below, thus markedly protruding into the space. The angled surface in front is left white but all the edges except for the lower, flatter side are blackened with charcoal. Here, the drawing on primed canvas even more strongly verges on a three-dimensional object, no longer assignable to any one genre. The spatial and yet planar perception evoked by the artist’s earlier two-dimensional works transitions here into real space. Both of the works on display toy with the viewer’s perception of space. They are juxtaposed in the FEATURE exhibition in such a way that they can be appraised in isolation and yet also enter into an exciting dialogue.